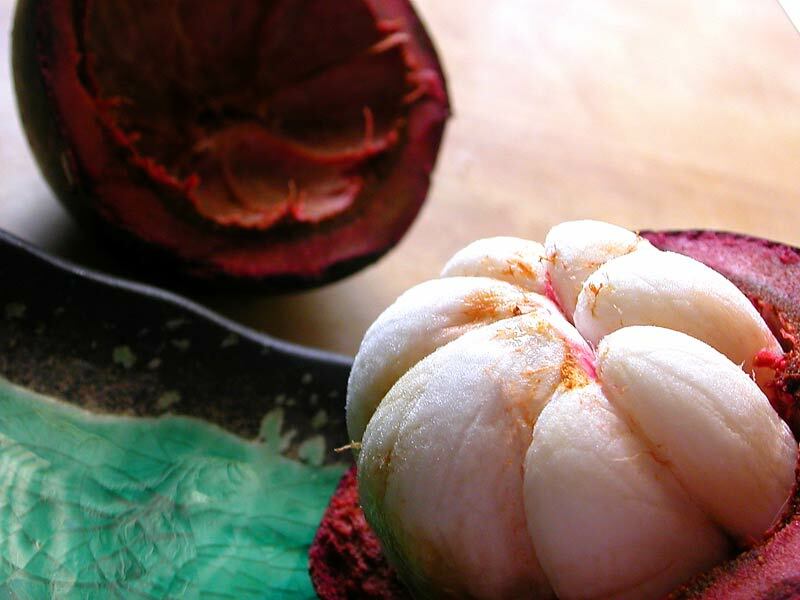 quite possibly my favourite fruit, ever: mangosteen, garcinia mangostana, from the family guttiferae. its origins have been traced to the malaccas and malaya, and is found throughout southeast asia, but very rarely outside of it. it has been planted with some success in the southern reaches of india, and in the west indies and central america, but attempts to cultivate it in the other americas, africa, and europe have been less than successful. so this, my dear tsogb readers in north america and europe, could possibly be the best fruit you'll never eat. it is a notoriously picky tree, difficult to grow, temperamental, and the fruit does not travel well. a diva, if you will. 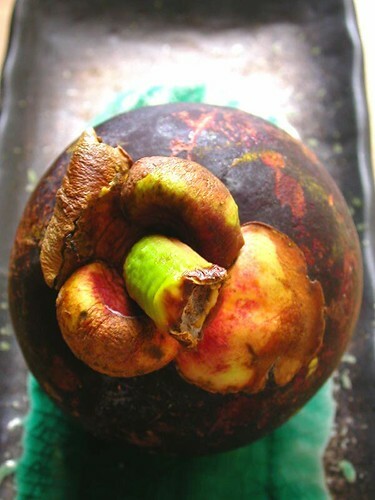 however, the mangosteen is a jewel, indeed--a smooth, round ball of deep purple-red to purple black, capped by a citrine calyx and a chartreuse stem. the outer "husk" is smooth and hard, but when ripe, a little light pressure will force it open. if the fruit is unripe or overripe, it is it nearly impossible to open the fruit--it becomes as hard as a rock, and even a good sawing or hard swing of a baseball bat has known to be futile. once inside, though, it reveals the creamy, opaque ivory white segments within, surrounded by a reddish-purpley rind that oozes an acidic yellow latex and a juice that will stain anything it touches horrendously. there are anywhere from four to eight segments in each fruit, the largest one(s) containing a seed, which is only viable for planting within 48 hours of uncovering it. so what does this elusive fruit taste like? i find that the flavour is reminiscent of every fruit you've ever eaten--a little like peach, strawberry, banana, mango, pineapple, pear, lychee, etcetera--and yet completely indescribable. heat and time destroy the flavour so it's impossible to taste a true mangosteen flavour from canned, dried, or bottled fruit or juice. it is sweet, tempered by a touch of sourness, it is bold, yet completely delicate. is it worth the trouble of planting, obtaining, opening, the acidic latex, and the staining juice? sweet sarah jessica parker! why yes, yes, a thousand times yes! it is. 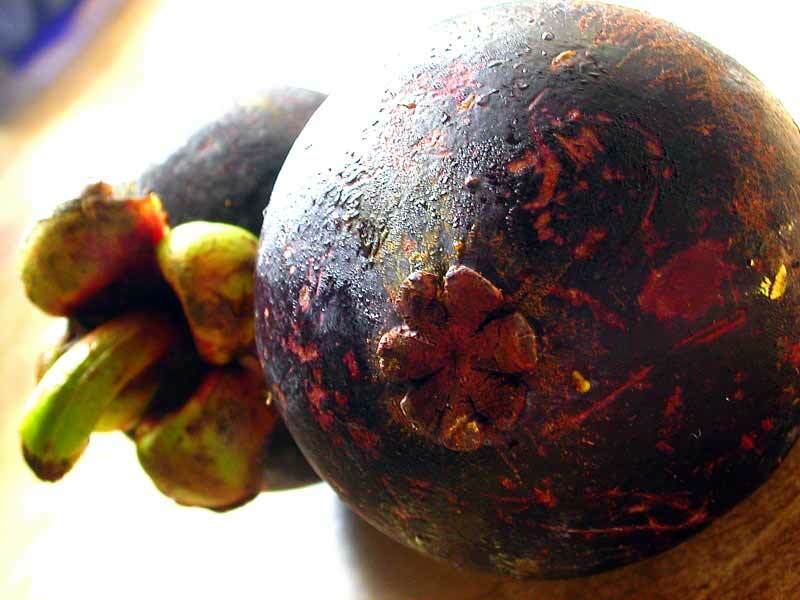 as it is completely banned from import into the united states and next to impossible to import anywhere else, i suggest anyone interested in trying this lovely gem to take a holiday anywhere mangosteen can be found, from now until september, whilst they are in season. and if you are lucky enough to find the limited edition häagen-dazs mangosteen sorbet, then good goddess, you better contact me, pronto! further reading: market manila's excellent post on this delicious fruit. imbb 15, pt. 2: a kiss, a blush, and the jealousy unfolds. i wanted to make a romantic dessert, but with romance you get complications, despite how simple it may seem. 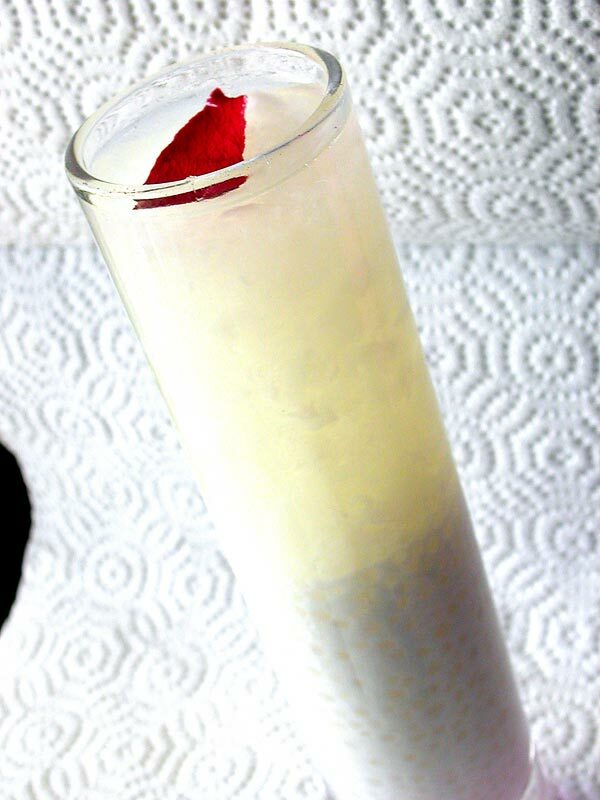 first: a kiss of rose petal, immediately followed by a blushing rosewater-scented sugar syrup. next: a softly set layer of gelatin made with lychee juice, shredded lychee fruit, and finely diced nata de coco coconut gel, which breaks through to tiny sago tapioca pearls in sweet coconut milk infused with the tiniest bit of star anise. it's always just a little murky and a little strange, isn't it? i leave it open to interpretations. to eat: set aside the rose petal. spoon up the sugar syrup with a bit of the lychee gelatin, but once it is gone, break up the rest of the jelly and eat with the sago pearly coconut milk. it's up to you if you want to get to the bottom of this. note: proportions for this are really off, as i've no idea how to make a small amount of tapioca. boil equal parts of sugar and water over medium high heat; simmer until volume has reduced to half. cool, then add rosewater syrup to to taste. dissolve 1 teaspoonful of agar-agar powder (or 1 tablespoonful of agar-agar flakes) in 250ml of lychee juice or young coconut juice. let sit for 10 minutes, then gently bring to a boil. let simmer for 5 minutes, then take off heat. add shredded lychee fruit and diced nata de coco coco gel. bring 3-4 cups of water to a boil, then add 1 cup of small sago tapioca pearls to the pot. stir occasionally so they don't stick to the pot or each other, and keep at a gentle boil until completely transparent, about 20 minutes? i sort of space out when i do this, it might be less. drain the water off the sago, and rinse them in cool water. set aside. gently heat 1 can of sweet coconut milk in a pot with one whole star anise. turn off heat, and incorporate the cooked sago pearls. leave to cool, then fish out star anise before serving. assembly: spoon tapioca into glass, then top with the still-liquid lychee gelatin. leave to set in refrigerator, about half an hour, then add a couple teaspoonfuls of the rosewater-infused syrup. 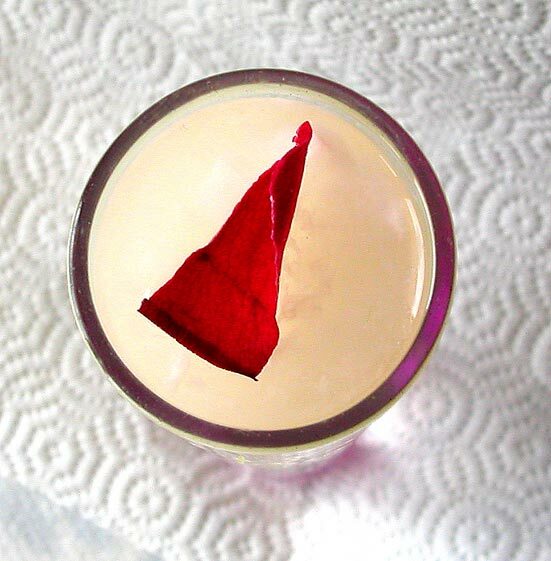 top with a little torn bit of rose petal. this edition of imbb is hosted by the lovely elise, the theme: has my blog jelled? and yes, yes, quite honestly i believe it has. several times over. 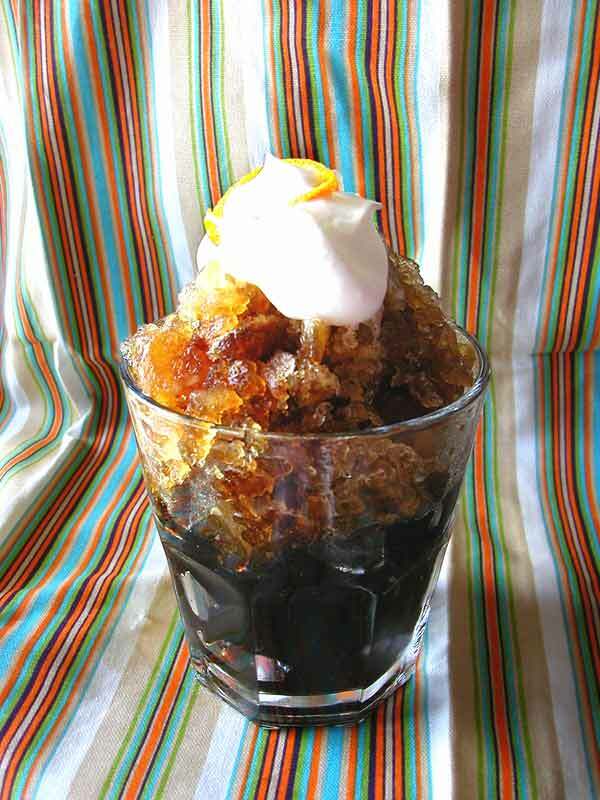 one of my absolute favourite things is coffee jelly (gelatin), which i generally just have with icy milk coffee, but lately the days have been intensely...toasty, so i decided to pair up the jelly with granita, to make my coffee cooler oh-so-breezy. as the granita melts, it mixes in to the whipped cream to form a slushy, jelly creamy treat. it's simple--all you really need is coffee, unflavoured gelatin, sugar and cream. however, the addition of cardamom in the granita and orange zest in the whipped cream will take this to another level, and the traditionally autumn spicing straight into summer with you. sprinkle the gelatin into a small amount of water and let it sit for several minutes. add the gelatin to coffee and sugar in a pan over low heat, and stir until completely dissolved, at least two minutes. pour into a shallow container, and refrigerate until firm. cut into small cubes. freeze 2 cups of freshly brewed coffee (you can add sugar, but i think with the sweetened jelly and whipped cream it's unneccessary) in a ziplocky type bag, and break up the freezing crystals every once in awhile, a la monkey. if you are too lazy for this method, wait until it's completely frozen and then bash it with a mallet until desired consistency has been met. i say smaller than hail, bigger than snowflakes. assembly: fill a glass halfway with the jelly cubes, then top with a heaping amount of granita. add whipped cream sweetened with a bit of sugar and zinged with a bit of orange zest and serve immediately because i am very amused by recipes that want you to serve things immediately. thank you elise! for hosting imbb this time around, and for having the round-up available in record time! a jonny angel special--icelandic pancakes with lingonberry preserves and touch of granulated sugar. jon says he's never had them in iceland, i've never had them anywhere until tonight, so i'm not sure what they are supposed to be like. 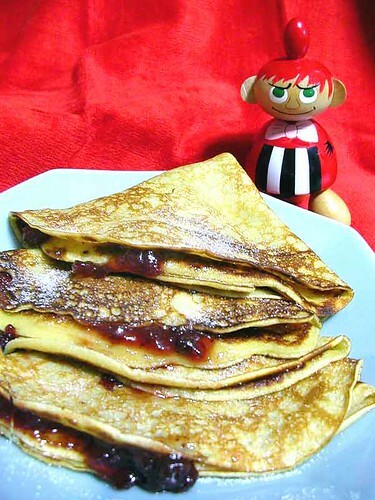 from what i've read crepe-like is the norm, so i used the recipe provided as a guideline with different proportions. this is what i ended up with, and they were kinda fabulous--softer and fluffier than crepes, and the added bit of cardamom nicely complemented the sweet-tart lingonberries. mix the dry ingredients together, then add the wet ingredients until just mixed. let it sit for half an hour. pour roughly 1/4 cup of batter onto a very hot, greased griddle and cook until each side is golden brown. spread some lingonberry preserves thinly onto one side, then fold into quarters. click the button and see! i have to admit, i've been a little green banana-y envious of how others are found on google, especially if you hit the "i'm feeling lucky" button and they top the list. pim used to have the best with "pim is a pig" but tragically is usurped by spiceblog with the exact same phrase. noodlepie had it for a minute with "wonderful photos", but sadly, that no longer is the case. he still does have wonderful photos, though. anyway, tonight i found the phrase that takes you straight to me: "asian death rituals". have you found your "i'm feeling lucky" phrase yet? i've just discovered that reid is pineapple man works for spiceblog as well. hm. vivilicious's lucky google phrase is the fantastic kimchi mania whilst exotica blog's jonny is definitely a kimchi librarian. did you know that if pierre herme tastes like pumpkin, you'd end up at a la cuisine! but if pierre herme tastes like squash you'd be at il forno? who knew? i'll bet monsieur herme didn't. 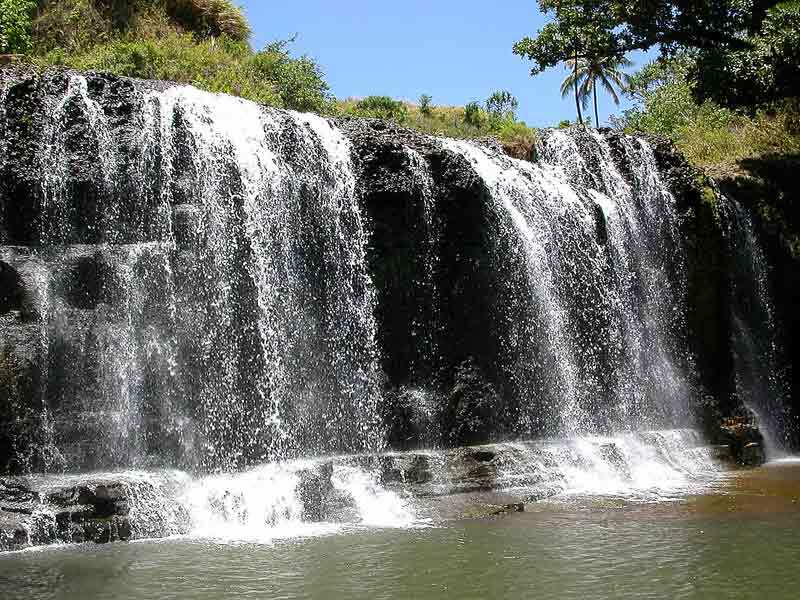 a couple of weeks ago, we somehow ended up visiting talofofo falls, in the southern part of guam. the south is less populated than the rest of the island, gorgeously scenic, and relatively unspoiled. however, one's choices of eating establishments are severely limited, so it was a pleasant surprise to find a little shack named mckraut's just down the road. face it, you're not going to mistake this for a fine dining establishment--it's a burger and 'dog shack just a few feet off the main road, in front of the owner's front yard, with two plastic picnic tables and a few chairs under canvas canopies off to one side. 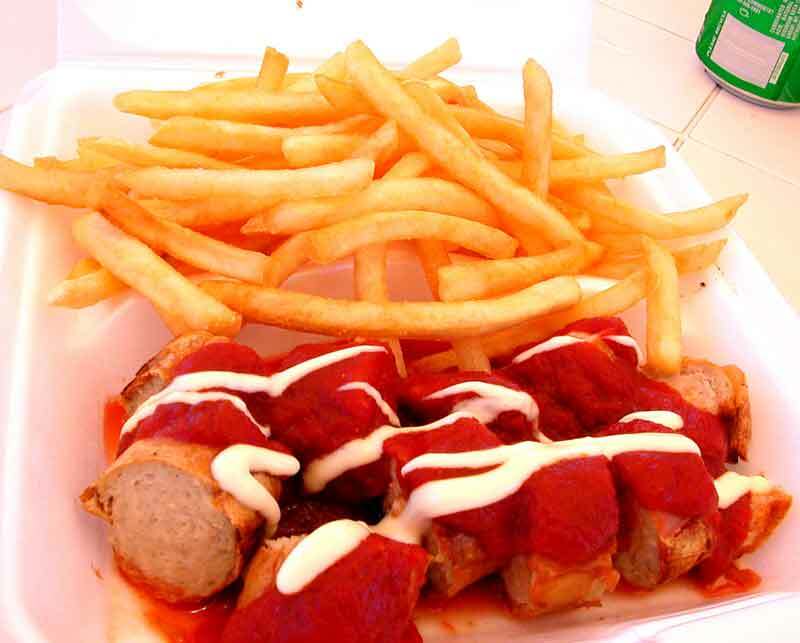 a bratwurst with curry ketchup, which i'm told is very popular. i honestly don't know what the qualities of a good bratwurst are, but this one wasn't bad--juicy, flavourful in a meaty way but not a spicy way, and tender in that way that only processed meats can be. springy. is that good? i feel like that should be good. it was a little smothered by the curry ketchup, but luckily the condiment went well with the surprisingly fantastic french fries. nenes, mckraut's is 26 miles away from the center of town, which is a big deal on an island only 32 miles long; however, as i am typing this, i am considering making that journey just for these french fries--piping hot, with a crispy outside that snaps to a tender fluffy inside, and actually tastes like potatoes. so very, very, very good and quite reasonably priced at $2.50 for a double order, which was like a small haystack. the chicken burger was tasty as well, fresh and juicy, with a homemade vinegar-based cabbage slaw on the side. i'm told the hot dogs were excellent, just a standard all-beef dog, but i can't give any other details as the teenagers with me scarfed down four of them in under 2 minutes, so there aren't any photos, but that has to be some sort of ringing endorsement. see sweaty kid with the half-eaten pastry? that's anthony, he was our chef for the day. he wasn't sweating when he cooked our food, and he's really nice, so say hi next time you're in the village. mckraut's (how crazy is that name?) is also a little ice cream stand, with prepackaged ice cream treats--in fact, when i was there, little kids from throughout the village would bike over for a soda or an itzakadoozie (my personal fave), cornetto or sundae bar, which i found rather charming, as i don't ever see that sort of thing anymore. just like the south in the mainland, life goes at a slower pace, and is far more relaxed. 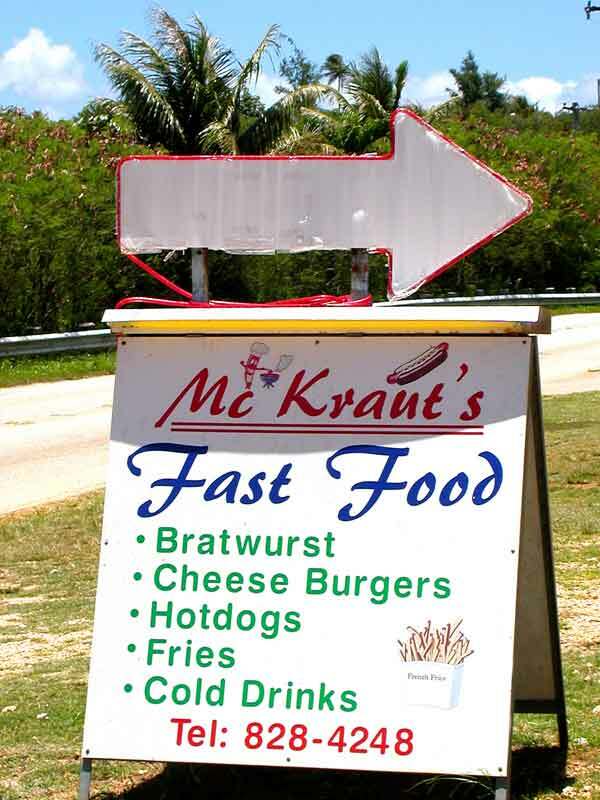 in fact, you can't really call mckraut's "fast" food, as you'd be lucky to get your order in under 15 minutes. 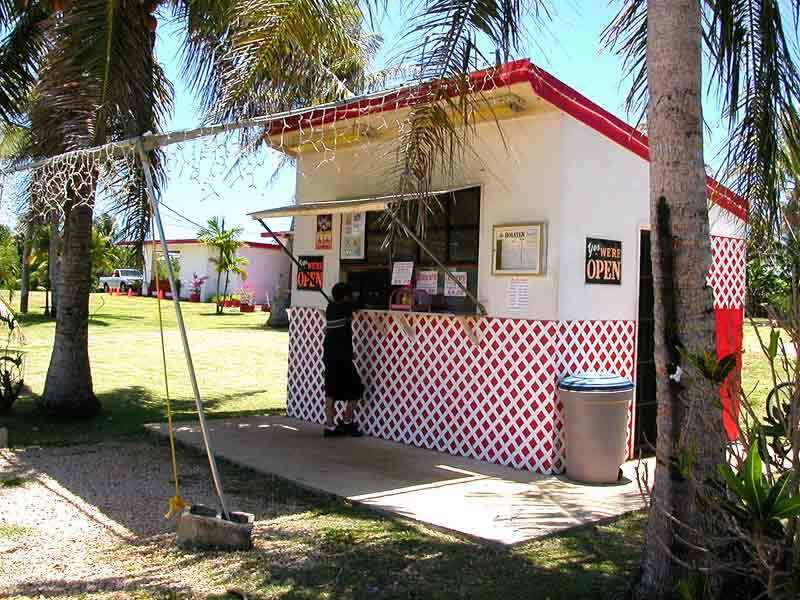 but if you are going to be strolling on a fine sunday afternoon, or need a little repast after spending time at the falls, you can do no better than this little hot dog stand in the south. ah, the cookbook meme, as brought forth by anthony. this is a self-activating meme, with no conditioners, so feel free to bring forth and multiply. 1. Rationale behind what we're seeing? books in a bookshelf. where they belong, unlike the other 50% which are scattered over the floor, still tucked in boxes and crates, or back in the familial homestead. i've been in this place for two years, and this is as far as i've gotten. they're not in any particular order (unlike my other books). bill granger's "sydney food", especially if you live in the southern hemisphere or in a mostly tropical clime and are not particularly adept in the kitchen. it's a great starter book, the recipes are pared down to the essentials, most of the ingredients are available throughout asia and the americas, and for pure satisfaction purposes, the food turns out exactly like it does in the photos. 3. Cookbook that made you what you were? what i was? cookbooks don't make me, manny, my family does. however, if one did, it might be "city cuisine" by mary sue milliken and susan feniger. 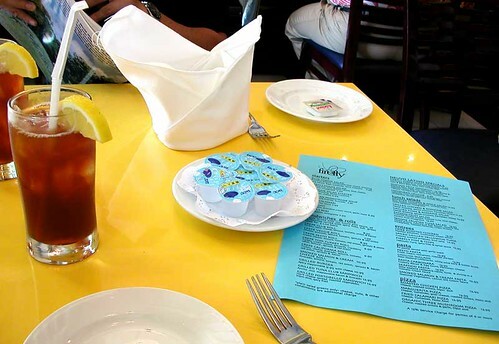 although my mother's and my family's cooking defines me foodily, city café in los angeles probably shaped my tastebuds more than any other restaurant. the only way to describe the food is fresh and precise. although, it's really mary sue and susan, i reckon, not really the book. definitely "intercourses: an aphrodisiac cookbook" which is not about the food, nenes, it's about the hotty bodies smeared with warm chocolate. paula deen's books get a mention because of the obscene amount of butter and cream in every recipe, and the lack of photos, so it's all left to your imagination. my current pillow book, though, is tetsuya wakuda's eponymous book, which is spare, sleek, and positively straining under the hidden sexuality trying to bust out of its austere sensuality. all about the texture, baby, you have to feel it. you mean, what book compels me to speak in a fake accent for three and a half hours? i would rather lose them all than save just one. i'm talking about cookbooks, folks! 6. 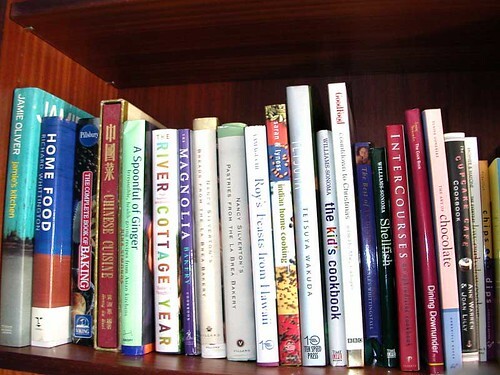 If you were a cookbook, which cookbook would you be? where to sin in san francisco by steve mcgarrett himself, jack lord. not strictly about food, but neither am i. 7. 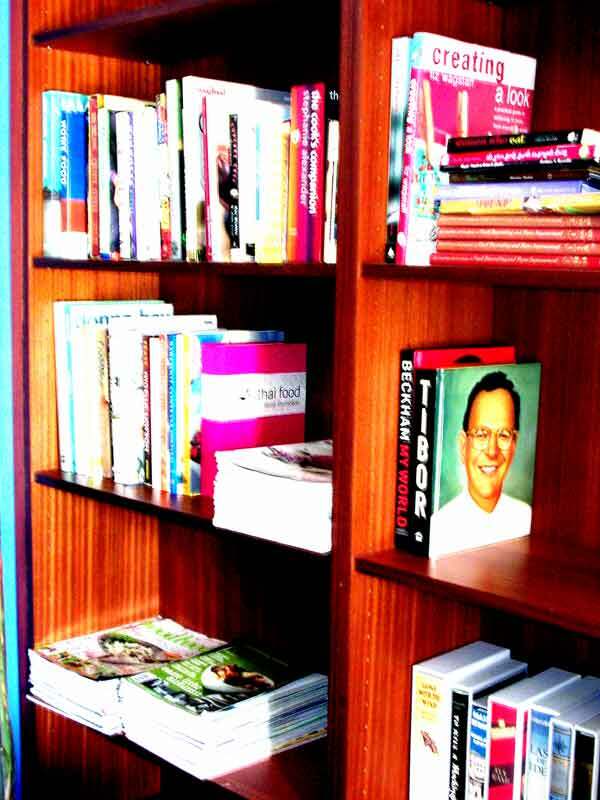 If your cookbook were extremely valuable, so valuable you might hide it with other valuables, where would that place be? 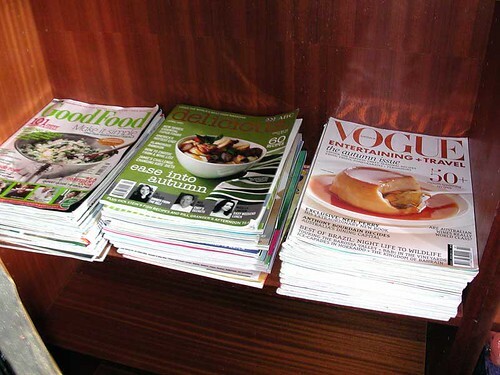 truthfully, i love my food magazines more. thanks anthony! it was fun, but i think i put everyone (including myself) to sleep! something to do with any leftovers you may have if you made the tarts in the previous post: freeze the custard until half frozen, then run it through a blender or food processor until the frozen chunks have broken down. 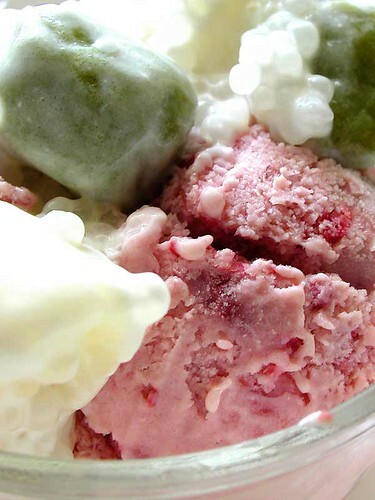 return to the freezer, and repeat the process several times until it reaches a thicker-than-smoothie consistency, then fold the smooshed up fruit into the frozen custard, and hey ho, let's go, it's raspberry ice cream! i had mine with tiny sago tapioca pearls in cream, and mochi flavoured with matcha green tea powder (the recipe can be found here). chewy, creamy, fruity, tea-y--wheeee. 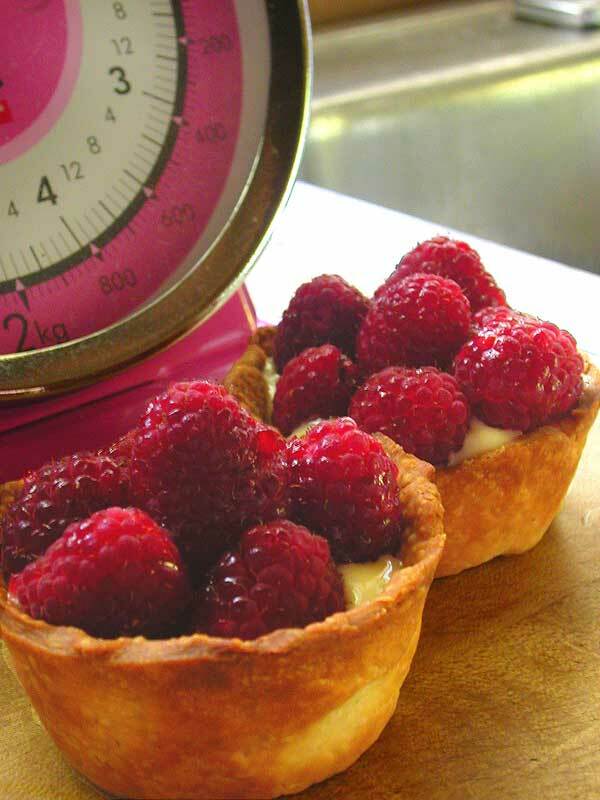 brightness in every bite: a very simple pie crust dough, with custard and fresh raspberries. any ripe berry will work, and if they are too tart, a little shoogyshake of confectioner's sugar on top will do ya! despite the previous rant, my cousin and i had a mild dilemma over where to go to lunch. mexican for cinco de mayo or japanese for kodomo no-hi? dilemma was solved when we drove by firefly bistro and the temptation of good and sometimes funky food in a somewhat chic yet somehow funky setting won out. food today: a lightly spicy fried calamari, with a garlic mayonnaise, and the firefly house salad of mixed greens, toasted pine nuts, golden raisins, bleu cheese and balsamic vinaigrette. 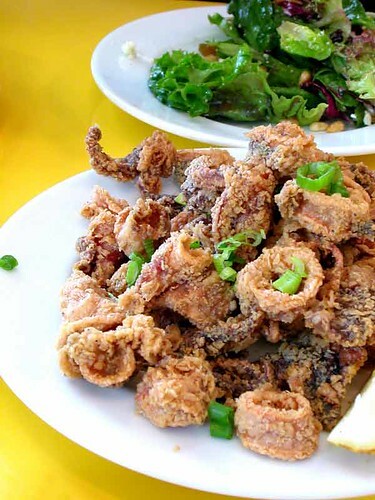 the calamari was plentiful, lightly but perfectly fried without a trace of grease, and stayed crispy even though it did get cold before we finished it (hey, it was a big pile). i like the salad a lot, as there's a nice blend of sweet and sour with the raisins and vinaigrette, with a touch of meatiness in the pine nuts and mustiness of the bleu cheese. my cousin thinks it's a little overwhelming, and would rather have one or two of the ingredients omitted for a cleaner taste. so, even though we bagged the themes, we did manage to find one item that actually seemed to be both latino and japanese, the honduran ceviche: raw yellowfin tuna marinated in a lime-ginger vinaigrette and coconut milk, and served with red corn tortilla chips. this was sean, the server's suggestion and it was excellent, despite how weird it may seem. 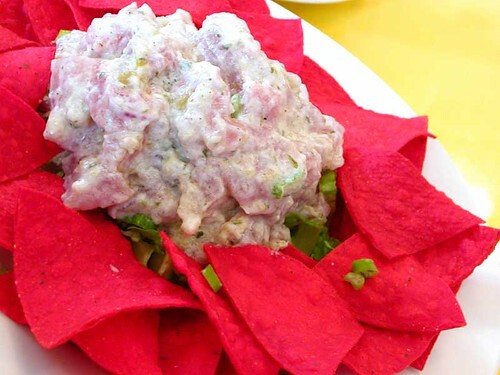 the fresh, sweet, yellowfin tuna chunks were slightly "cooked" by the marinade, and the sweet, clean taste of the fish was enhanced by the coconut milk and the slightly salty, toasty tortilla chips. the chef, veronica perez-calvo, also owns the bakery next door, cup and saucer, so firefly rather excels at desserts, but we were quite full, so i'll have to leave those for another time. okay, someone explain to me why cinco de mayo is more popular in the united states than in mexico, especially considering it does not commemorate mexican independence day, but la batalla de la puebla, when mexican forces defeated napoleon's army in 1862. how does this figure more prominently in american history than mexico's independence that it is considered a fairly noteworthy day of celebration? 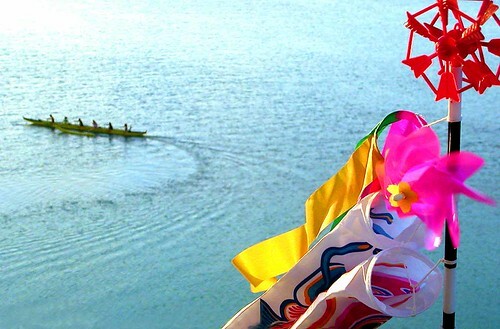 also, why is this "foreign" holiday more interesting than the national japanese holiday of kodomo no hi, children's day, which is also celebrated on the fifth of may? kodomo no hi celebrates the respect of children and of promoting their general welfare, along with gratitude towards parents for raising their children well, while i think for the american majority cinco de mayo promotes drinking and partying but not necessarily the respect of the mexican culture. come to think of it, does the united states even have a national holiday that is about the mutual respect of children and their parents? 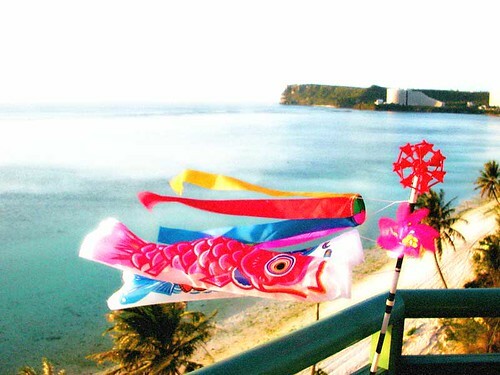 anyway, i'm not particularly well-versed in the rituals of children's day, but i do like what it stands for, and i'm happy that there's a big enough japanese community on island to enjoy some of the festivities. if you have children or if you are lucky to still have your parents around, maybe you can honour the day in your own little way, in regards to them. and hopefully it will be reciprocated. i'm sure it will. good god y'all! 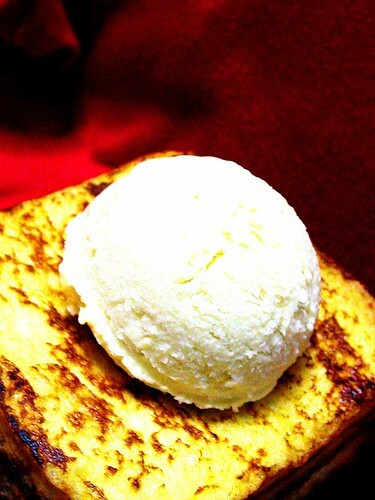 i need to take some french lessons and fast, 'cause in english, this sounds funky bad: french toast with chestnut vanilla creme and frozen egg custard. i'm guessing in french it would be pain perdu au crème marrons vanille et glace à base de crème anglaise. >phew< oh, don't quote me--i took spanish! oh, and this is my take on a japanese dessert, which i assume is a take on an american breakfast, with french embellishments. how does this stack up? well, me lovelies, eeet ees like zeees: three slices of japanese-style american-style sandwich white bread (as opposed to japanese-style american-style not sandwich white bread) were thinly spread with chestnut vanilla cream, stacked, crusts trimmed, then dipped in an eggy milk mix and browned in butter. a simple custard was made, cooled, poured into a ziplocky-type sandwich bag, then thrown into the freezer, only to be mauled and pummeled every 15 minutes until a creamy frozen confection was formed. really. it works. in hindsight, i should've pulled out the ice cream maker but eh. so it took a few hours and is not as super mega mondo creamy as it could be. it was only creamy creamy. didn't stop me any. i got egg, i got toast--eomeote, out! winnie mentioned that she would try to make tofu from a mix for the hiya-yakko from the previous post, and if it didn't work, she'd just pour ginger sauce on it. funnily, as i was reading that, i was digging into a piece of kinu tofu with ginger sauce myself. the dessert itself is a very soft tofu served with a brown sugar ginger sauce; in the philippines it's called taho, i think in chinese it's tau huay or something close to that. 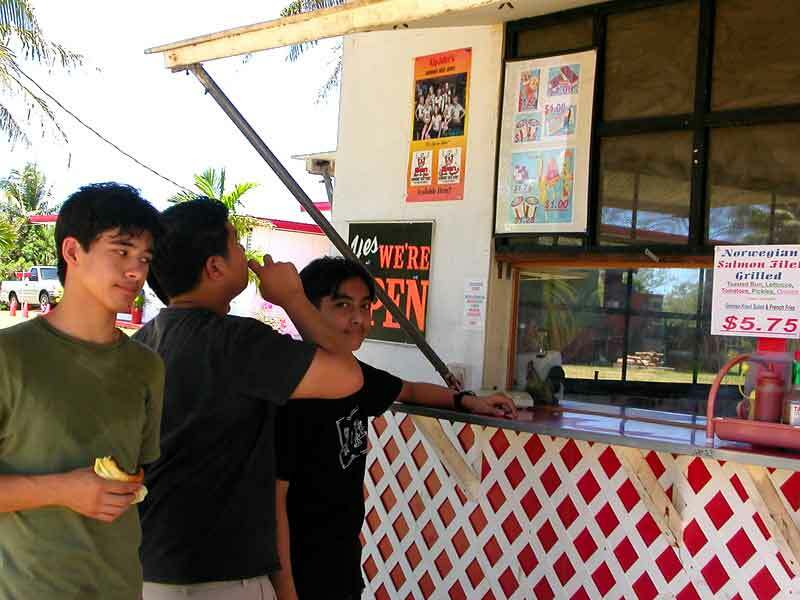 usually it's served warm, but in manila, you can get it ice cold, which is quite refreshing on a hot day. like today. like yesterday. ayyyyyyyy. anyway, silken tofu is a pretty decent substitute for the real thing. boil the ginger, water and sugar for at least 10 minutes. the longer you boil, the spicier it gets; alternately, take it off the heat and leave to cool in the fridge overnight. strain the ginger pieces out and discard, or save for whatever reason you might like brown sugared ginger. 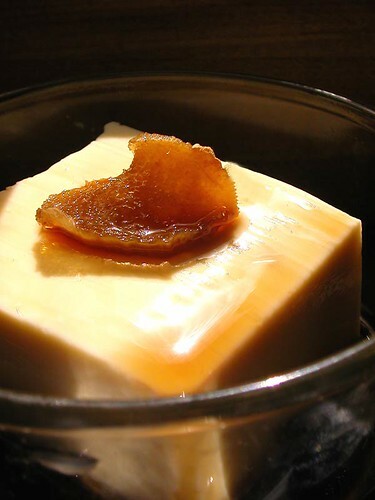 serve warm or cold, poured over silken tofu.